A thrilling journey around the world…a classic tale for a new generation of readers! 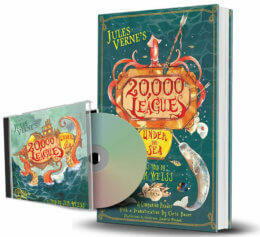 Includes a digital download of the audiobook, and a physical copy of the illustrated companion book. Lost at sea, three friends find themselves on a fantastic underwater ship, the Nautilus. You will dive deep into adventure as our heroes battle giant squid, navigate dangerous oceans, and discover new creatures and fabulous treasures. But who is the mysterious Captain Nemo? Why is he being hunted by every navy on earth? And will he ever let the three castaways return home? 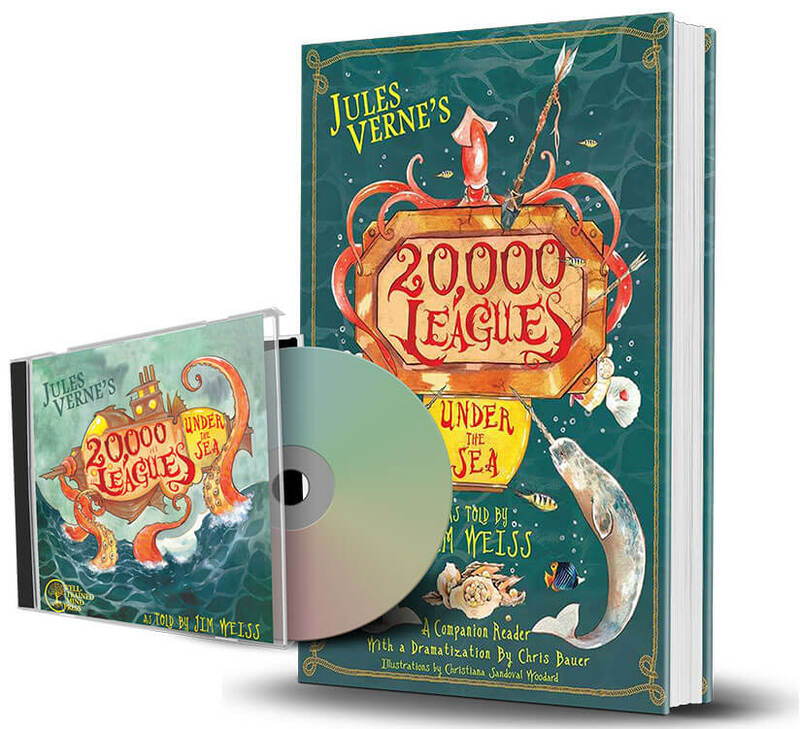 This beautifully illustrated Companion Reader is an exact transcript of Jim Weiss’s award-winning storytelling performance of Jules Verne’s Twenty Thousand Leagues Under the Sea, available on MP3 and audio CD from Well-Trained Mind Press. The Reader can be enjoyed on its own, or used along with the recorded performance to build strong language skills. Listen to the Jim Weiss story, read along to improve fluency, vocabulary, and grammar, and then speak great words and sentences out loud by practicing and performing the short, accessible dramatic version of Jim’s performance. A complete script, stage direction, and acting tips are included. Format: Paperback book and downloadable audio MP3 files. Jim Weiss’s storytelling recordings have received the highest awards from the Parents’ Choice Foundation, Oppenheim Toy Portfolio, The Film Advisory Board, and The American Library Association, and have been widely praised in major publications across North America and internationally. He has captivated and delighted child and adult audiences with his original stories and his retellings of ancient and modern classics. For performance availability, distribution information, and additional titles, please visit www.jimweiss.com. Great literature and science merge in this masterpiece of adventure featuring mysterious Captain Nemo and brilliant scientist, Pierre Aronnax.